Community News: 2019 Oakville Community Spirit Awards Nominations Are Open! Few communities can match the sense of togetherness and closeness that Oakville has, a trait that draws more people to it by the day. With the upcoming Oakville Community Awards, the people that make Oakville extra special will be given due recognition. Oakville is looking for its 2019 Community Champions. If you know someone or a group who spends hours volunteering to contribute to the community of Oakville, now is the perfect time to give them the recognition that they deserve. Their generous spirit makes Oakville a better town to work, live in, and play. Wouldn’t it be great to nominate them to be recognized at the Oakville Community Awards Ceremony? You have 2 more weeks to submit your nominations. The last day for the nominations is April 17, 2019 with a deadline of 4 p.m. Here is a link to the online application form. What Criteria Are They Looking For? Besides the love for Oakville and its community, more information regarding the award categories, selection criteria, selection process, and submission requirements are available at the Oakville Community Awards PDF. Below are the categories for which you can submit your nominations. Access Award (which is sponsored by Access Abilities) salutes individuals, organizations, or businesses that made a notable or ongoing contribution that is more than legislated requirements to improve the well-being and advancement of individuals with disabilities in Oakville. Arts Award (which is sponsored by The Oakville Beaver) gives recognition to an organization or individual that contributed to the arts in Oakville through volunteerism. Group Volunteer Award (which is sponsored by First Ontario) recognizes a group with a minimum of 3 individuals who came together to volunteer for a shared activity, goal, or event that involves creativity, innovation, and leadership. Heritage Award (which is sponsored by Genworth Financial Canada) honours an organization or individual with an outstanding contribution to Oakville through the celebration and preservation of the cultural, built, or natural heritage in Oakville. Individual Volunteer Award (which is sponsored by the Oakville Community Foundation) salutes an individual who made a notable contribution to the well-being of Oakville residents. This can be at any age group. 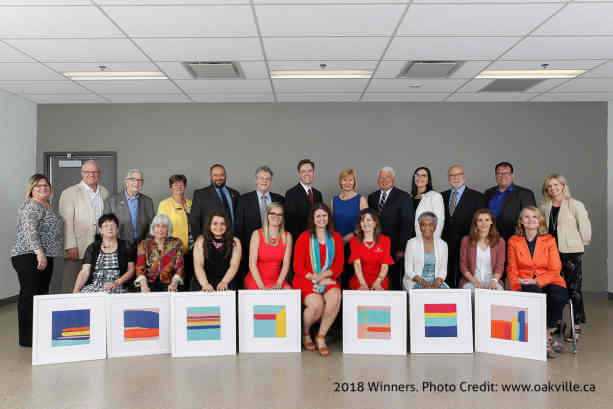 Senior Award (which is sponsored by Chartwell Waterford Retirement Residence) gives recognition to a senior group or individual who made a distinguished voluntary contribution to the community of Oakville. Youth Award (which is sponsored by RBC Royal Bank) honours a group of youth or an individual 18 years old and under who has made positive contributions in enriching the quality of life in Oakville. The 18th Annual Oakville Community Spirit Awards will be held on a Thursday, the 6th of June 2019 at the Queen Elizabeth Park Community and Cultural Centre. You may go to witness the ceremony by purchasing tickets for $15 each. Want to move to Oakville this year? Now is the best time to scout for an Oakville home! Contact us and talk to our agents to be part of the Oakville community soon!